Stump the Priest: What do you do when you see someone else mistreated? Question: I know that Jesus Christ teaches that we should turn the other cheek and forgive those who offend us. But, my question is, how should I, as a Christian, react when I see a friend being treated badly? I know someone who is very elderly and her son is so distant with her. I call her everyday because I see that she needs companionship. She's a widow. I visit her and talk with her, but I can't do all the things she needs because he's the legal relative. Her heart is breaking because she sees that her son doesn't care to take time with her. And inside, it makes me boil with anger for his negligence of his own mother. I want so much to tell him off. When she falls asleep in Christ, I don't know if I'll be able to hold back on telling him how much his mother was suffering because of his lack of love towards her. This is a complicated question that does not lend itself to simple answers. "Moreover if thy brother shall trespass against thee, go and tell him his fault between thee and him alone: if he shall hear thee, thou hast gained thy brother. But if he will not hear thee, then take with thee one or two more, that in the mouth of two or three witnesses every word may be established. And if he shall neglect to hear them, tell it unto the church: but if he neglect to hear the church, let him be unto thee as an heathen man and a publican. Verily I say unto you, Whatsoever ye shall bind on earth shall be bound in heaven: and whatsoever ye shall loose on earth shall be loosed in heaven." Even if he were a non-Orthodox Christian, you could try talking to him, and if that did not work, you could try talking to his pastor. However, if he took his faith seriously, in all likelihood, he would not be treating his mother in the manner that you describe. As St. Augustine put it: "It's your parents you see when you first open your eyes, and it is their friendship that lays down the first strands of this life. If anyone fails to honor his parents, is there anyone he will spare?" ((Sermon 9.7, quoted in Ancient Christian Commentary on Scripture: Old Testament, Vol. III, Joseph T. Lienhard, ed. (Downers Grove, IL: Intervasity Press, 2001) p. 106)). If, as is likely, the son is not a serious Christian of any kind, how you should approach him is a question of wisdom. It is not a question of turning the other cheek, when it is someone else's cheek that is being slapped. In fact, we are called upon by Scripture to defend the helpless: "Learn to do good; Seek justice, Rebuke the oppressor; Defend the fatherless, Plead for the widow" (Isaiah 1:17). But you should approach this situation in such a way that you will help your friend, and as much as possible, help the son to come to see his responsibilities to his mother. The time to confront him, if you confront him at all, would be to do so before your friend has passed away... and your purpose has to be to help these two people, not simply to tell him off. What I would suggest you do is first talk to your friend to see what she would suggest. Then I would talk to other people whose opinion you respect, and who perhaps have some experience dealing with difficult situations of this sort. As Proverbs 11:14 says: "Where no counsel is, the people fall: but in the multitude of counselors there is safety." You also should pray for God's guidance. Pray that He would give you the wisdom to handle the situation properly, and pray sincerely for both the mother and the son. Then after you have sought wise counsel, and prayed for God's guidance, do what seems to be the wisest thing, and do it in a humble and loving way. Stump the Priest: Is There Anything Special About the Virgin Mary? Question: I know a protestant who argues that there was nothing significant about the Virgin Mary, and that just about any woman who was a believer "would have been just as good a selection.” How would you reply to someone that said there was nothing special about the Virgin Mary and basically anyone else could have done what she did? There is of course a great deal that could be said about the Tradition of the Church to contradict what this protestant said, but when arguing with protestants, the arguments that they will find most persuasive are arguments from Scripture. I would point out, first off that he has no basis in Scripture for the assertion that any other woman would have been just as good of a selection. Scripture does not tell us explicitly why God chose the Virgin Mary, but when we see her obedience, humility, love, and long-suffering in the Gospels it is clear that she was not just a randomly chosen Jewish girl, but rather an extremely holy woman. 1. 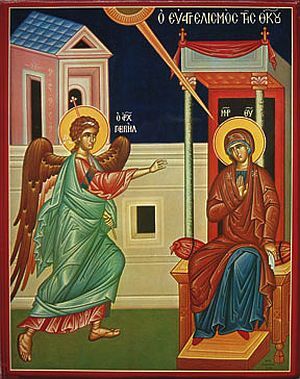 The Archangel Gabriel greeted her with the words: "Rejoice, thou that art full of grace, the Lord is with thee: blessed art thou among women" (Luke 1:28). It is no small matter to be full of grace, for the Lord to be with you, and to be the most blessed of women. 2. When the Virgin Mary went to visit St. Elizabeth, the mother of St. John the Baptist, we are told: "And it came to pass, that, when Elizabeth heard the salutation of Mary, the babe leaped in her womb; and Elisabeth was filled with the Holy Spirit: and she spake out with a loud voice, and said, Blessed art thou among women, and blessed is the fruit of thy womb. And whence is this to me, that the mother of my Lord should come to me? For, lo, as soon as the voice of thy salutation sounded in mine ears, the babe leaped in my womb for joy. And blessed is she that believed: for there shall be a performance of those things which were told her from the Lord" (Luke 1:41-45). At the sound of the Virgin Mary's voice, Elizabeth was filled the Holy Spirit. We are again told that she is the most blessed of women, she is called the mother of the Lord, and Elizabeth states that she is unworthy of the honor that the mother of her Lord should visit her. She also states that she is blessed because of her faith. 3. The Virgin Mary herself, in her Magnificat, said "...from henceforth all generations shall call me blessed" (Luke 1:48). So I would ask your protestant friend why, if every generation will call her blessed, he refuses to do so along with them? "In accordance with this design, Mary the Virgin is found obedient, saying, “Behold the handmaid of the Lord; be it unto me according to thy word.” But Eve was disobedient; for she did not obey when as yet she was a virgin. And even as she, having indeed a husband, Adam, but being nevertheless as yet a virgin (for in Paradise “they were both naked, and were not ashamed,” inasmuch as they, having been created a short time previously, had no understanding of the procreation of children: for it was necessary that they should first come to adult age, and then multiply from that time onward), having become disobedient, was made the cause of death, both to herself and to the entire human race; so also did Mary, having a man betrothed [to her], and being nevertheless a virgin, by yielding obedience, become the cause of salvation, both to herself and the whole human race. And on this account does the law term a woman betrothed to a man, the wife of him who had betrothed her, although she was as yet a virgin; thus indicating the back-reference from Mary to Eve, because what is joined together could not otherwise be put asunder than by inversion of the process by which these bonds of union had arisen; so that the former ties be cancelled by the latter, that the latter may set the former again at liberty. And it has, in fact, happened that the first compact looses from the second tie, but that the second tie takes the position of the first which has been cancelled. For this reason did the Lord declare that the first should in truth be last, and the last first. And the prophet, too, indicates the same, saying, “instead of fathers, children have been born unto thee.” For the Lord, having been born “the First-begotten of the dead,” and receiving into His bosom the ancient fathers, has regenerated them into the life of God, He having been made Himself the beginning of those that live, as Adam became the beginning of those who die. Wherefore also Luke, commencing the genealogy with the Lord, carried it back to Adam, indicating that it was He who regenerated them into the Gospel of life, and not they Him. And thus also it was that the knot of Eve’s disobedience was loosed by the obedience of Mary. For what the virgin Eve had bound fast through unbelief, this did the virgin Mary set free through faith" (Against Heresies 3:22:4). So the attitude taken by your protestant friend is neither Biblical, nor consistent with the view found in the early Church. Stump the Priest: What does John 20:17b mean? 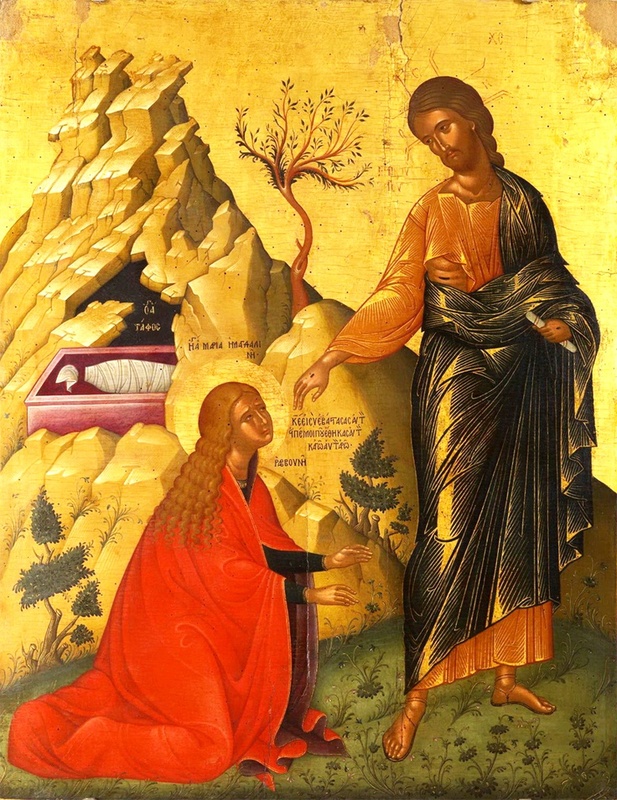 Question: What did Christ mean when He said to St. Mary Magdalene, "...but go to my brethren, and say unto them, I ascend unto my Father, and your Father; and to my God, and your God" (John 20:17b)? The simplest and most direct answer to this is given by Blessed Theophylact: "God is indeed our Father, but only by grace. He is Christ's Father by nature. On the other hand, the Father is our God by nature; He is Christ's God in respect to his human nature alone. Only after assuming human nature can Christ say the the Father is His God." (The Explanation of the Holy Gospel According to John. Fr. Christopher Stade, Trans. (House Springs, MO: Chrysostom Press, 2007), p. 298). St. Cyril of Alexandria wrote: "I will explain, then, as far as I am able: In the first place, then, though we are servants by rank and nature (for creatures are subject to their Creator), He calls us His brethren, and designates God the common Father of Himself and us; and, making humanity His own, by taking our likeness upon Him, He calls our God His God, though He is His Son by Nature; that, as we mount up to His exceeding great dignity of station by likeness to Him (for it is not because we are by nature sons of God that we are so called, for He cries in our hearts by His own Spirit, Abba, Father), so also He, since He took our form -- for He became Man, according to the Scriptures -- might have God for His God, though He was truly God by Nature, and proceeded from Him. Be not, therefore, offended, though you hear Him calling God His God, but rather contemplate His words in a teachable spirit, and attentively consider their true meaning. For He says that God is both His Father and our God; and both sayings are true. For, in very truth, the God of the universe is Christ's Father, but not ours by nature; but rather our God as our Creator and Sovereign Lord. But the Son, as it were, blending Himself with us, vouchsafes to our nature the dignity that is in a special and peculiar sense His own, calling Him That begat Him the common Father of us all; while, on the other hand, He receives into Himself, by taking upon Him our likeness, that which belonged to our nature. For He calls His Father His God, being unwilling, through His inherent love and mercy toward mankind, to dishonour our likeness that He had taken upon Himself. If, then, you choose in ignorance to cavil at this saying, and it seem intolerable to you that the Lord should say that God the Father was His God, you will then, in your perversity, be bringing a charge against the scheme for your own redemption; and when you ought to be offering up thanksgiving you will be dishonouring your Benefactor, and be foolishly objecting to the manner in which He manifested His love towards you. For if He humbled Himself, despising shame, and became a Man for your sake, on your head is the charge of humiliation, and to Him Who chose to undergo this for your sake, exceeding great is the honour due. And I am amazed that you have ears merely for the eclipse of glory (for He humbled Himself for our sake), and consider not its restoration, and, regarding only the degradation, reflect not upon the exaltation. For how was He humiliated, if you do not regard Him as perfect, as being God? And in what sense was He degraded, if you do not take into account the lofty attributes of His ineffable Nature? Therefore, when He was perfect and all-sufficient as God, He humbled Himself for your sake, transforming Himself to your likeness; and though He was high exalted as the Son of God, and of the very Essence of the Father, He degraded Himself, being mulcted of the attributes of Divine glory, so far as His Nature admitted. As therefore, now, He is at the same time God and Man, being high exalted because of His parentage (for He is God of God and truly Begotten of His Father), and also made lowly for our sake (for He became Man for us); be of a tranquil mind when you hear Him saying: I ascend unto My Father and your Father, and My God and your God. For it was very meet and right that, as being by Nature God and Son of God, He should call Him That begat Him His Father; and that, as being Man, even as we are men. He should call God His God" (Homilies on the Gospel of John, Book XII, chapter 1). St. Augustine said: "He saith not, Our Father: in one sense, therefore, is He mine, in another sense, yours; by nature mine, by grace yours. “And my God, and your God.” Nor did He say here, Our God: here, therefore, also is He in one sense mine, in another sense yours: my God; under whom I also am as man; your God, between whom and you I am mediator" (Homilies on the Gospel of John, Tractate 121:3). St. Cyril of Jerusalem said: "But lest any one from simplicity or perverse ingenuity should suppose that Christ is but equal in honour to righteous men, from His saying, I ascend to My Father, and your Father, it is well to make this distinction beforehand, that the name of the Father is one, but the power of His operation manifold. And Christ Himself knowing this has spoken unerringly, I go to My Father, and your Father: not saying ‘to our Father,’ but distinguishing, and saying first what was proper to Himself, to My Father, which was by nature; then adding, and your Father, which was by adoption. For however high the privilege we have received of saying in our prayers, Our Father, which art in heaven, yet the gift is of loving-kindness. For we call Him Father, not as having been by nature begotten of Our Father which is in heaven; but having been transferred from servitude to sonship by the grace of the Father, through the Son and Holy Spirit, we are permitted so to speak by ineffable loving-kindness (Catechetical Lectures 7:7). "But the Father having begotten the Son, remained the Father and is not changed. He begat Wisdom, yet lost not wisdom Himself; and begat Power, yet became not weak: He begat God, but lost not His own Godhead: and neither did He lose anything Himself by diminution or change; nor has He who was begotten any thing wanting. Perfect is He who begat, Perfect that which was begotten: God was He who begat, God He who was begotten; God of all Himself, yet entitling the Father His own God. For He is not ashamed to say, I ascend unto My Father and your Father, and to My God and your God. But lest thou shouldest think that He is in a like sense Father of the Son and of the creatures, Christ drew a distinction in what follows. For He said not, “I ascend to our Father,” lest the creatures should be made fellows of the Only-begotten; but He said, My Father and your Father; in one way Mine, by nature; in another yours, by adoption. And again, to my God and your God, in one way Mine, as His true and Only-begotten Son, and in another way yours, as His workmanship. The Son of God then is Very God, ineffably begotten before all ages (for I say the same things often to you, that it may be graven upon your mind). This also believe, that God has a Son: but about the manner be not curious, for by searching thou wilt not find. Exalt not thyself, lest thou fall: think upon those things only which have been commanded thee. Tell me first what He is who begat, and then learn that which He begat; but if thou canst not conceive the nature of Him who hath begotten, search not curiously into the manner of that which is begotten" (Catechetical Lectures 11:18-19). We know that this text is not saying that Christ is not God, because at the very beginning of the Gospel of John, we are told that not only was the Word (Christ) with God, but that the Word was God (John 1:1). And later in the same chapter as the verse in question, St. Thomas, upon understanding that Christ was truly risen, addressed Christ, saying "My Lord and my God!" (John 20:28) -- and Christ did not rebuke or correct him, but rather confirmed his statement by responding "Thomas, because thou hast seen me, thou hast believed: blessed are they that have not seen, and yet have believed" (John 20:29). Levant Report’s own sources inside Syria were present in Saidnaya this week: they report that the townspeople are now sounding the alarm to the international community that Islamist rebels in the surrounding mountains are preparing a major invasion of the Christian city. The primary aim of the rebels, the inhabitants fear, is to commit “religious cleansing” against Christians – similar to what happened only months ago in nearby Maaloula. A reluctant international press is also beginning to acknowledge the potential for a genocidal event against Saidnayans, yet disinformation is already in full swing. This past Thursday, February 6, monasteries and churches in the ancient Christian city of Saidnaya held special celebrations for the feast of St. Elian – a Syrian saint martyred in Homs in the third century. These celebrations took place despite the village being under constant rebel mortar attack – attacks that have been stepped up over the last month. Saidnaya, which lies 25 minutes by car north of Damascus, and 40 minutes to the southwest of Maaloula, is (alongside Maaloula) Syria’s most celebrated and historic Christian city. Its scenic location at the edge of the Qalaman Mountains, its active churches and monasteries that go back to the time of Emperor Justinian, and multiple restaurants and resort hotels made it a favorite weekend getaway destination for Syrians and tourists of all backgrounds prior to the chaos of the last couple of years. Saidnaya has, until recently, managed to stay quiet and relatively peaceful for most of the nearly three years of the Syria conflict. Its 5 active monasteries, dozens of churches, and large convent orphanage for girls, have continued life as usual as they have over the past many centuries living under multiple regimes - from the Byzantines to the Ottomans to the Ba’ath. The mostly Orthodox Christian population tends to be presented as “pro-regime” in Western media reports – this perhaps because Syria’s most well-known political prison is located in Saidnaya. But the city’s Christian population believes that its very survival is dependent on the government checkpoints, tanks, and soldiers that protect it from the thousands of foreign-backed insurgents that are hunkered down in the surrounding Qalamon Mountains. Unlike the very politically involved Maronites of Lebanon, Syria’s Christian population tends to keep a low-profile, and has enjoyed the historical toleration shown by the secular pan-Arab Ba’athists and socialist nationalist politicians that have led the country for much of Syria’s modern period. It appears that the Islamist opposition forces who wrecked [sic] havoc in Maaloula may be preparing for a similar assault on the equally important Christian village of Saidnaya. On Oct. 1, Fides (a site of the Vatican news network) reported that raids were now commonplace and that one man was dead after clashes the previous day. Since October, insurgents have mounted multiple unsuccessful attempts to capture the mountaintop which overlooks Saidnaya – a strategic place from which they could destroy the city below. At the highest point of this mountain sits Cherubim Monastery – an active monastery and retreat center which has an important cultural heritage site: a church which dates to the third century. One of the tallest Christ statues in the world was recently erected on the monastery grounds - a towering 39 meters tall bronze sculpture that was years in planning with the help of Russian benefactors. During the spring and summer months, Cherubim Monastery hosts Christian youth camps and church schools. The monks recently had to leave the monastery due to the frequent rebel incursions around the mountain; they are now sheltered in St. George Monastery in the village below. Saidnaya has recently faced sectarian attacks similar to Maaloula, another Aramaic-speaking pilgrimage destination just 15 miles north. In addition to displacing tens of thousands of people, the attacks have prompted 50,000 Syrian Christians to apply for citizenship in Russia, reports Interfax. “It is for the first time since the Nativity of Christ that we Christians of Qalamoun living in the villages of Saidnaya, Maara Saidnaya, Maaloula and Maaroun are under threat of banishment from our land,” reads the group’s appeal to the Russia Foreign Ministry. The parallels between Maaloula and Saidnaya are all too evident: both are iconic Christian cities that have done their best to prevent conflict from entering their sleepy countryside environs; both contain Syrian cultural and UNESCO heritage sites valued by all Syrians; both have convent-run orphanages for girls and charitable centers and retreat centers; and both are overlooked by mountains from which rebels can wreak havoc and terror on a vulnerable population. Sadly, Maaloula now sits liquidated of its Christian inhabitants (some were kidnapped, some killed, and most fled to Damascus). Our Lady of Saidnaya Convent and Orphanage is significantly larger than Maaloula’s St. Thekla Convent. It was the very first target of rebel insurgent attack on the city as it was struck by mortar fire back in January 2012. Note that in spite of current opposition and media claims that Saidnaya is primarily a government/military target, this first target of attack was a community of elderly nuns and young orphan girls. We all know the story of Maaloula. A reluctant international press picked up on the terror attack after it was too late – and even then major outlets like the New York Times did their best to protect the reputation of the rebel insurgents involved in the takeover and brutal cleansing of the city’s Christian population. Maaloula was of no real strategic value to the rebel insurgents – their own actions in the aftermath of the assault testify to the fact that the town’s religious identity had everything to do with it. Levant Report’s sources, which have a close affiliation with Maaloula’s St. Thekla Convent, confirm that the ancient monastery church and side chapels were stripped completely of their priceless religious icons, and other religious objects were urinated and defecated upon. Christian villagers who were caught in the midst of the rebel assault had their throats slit, or were shot execution style at close range. The video and photographic evidence available after the attack indicates that the operation was a coordinated effort between (at least) the following groups: Ahrar al-Sham, Jabhat al-Nusra, the Baba ‘Amr Brigades (a rebel group possibly affiliated with the SIF – Syrian Islamic Front), FSA Commandos Unit, and Soqour al-Sham. It is important to remember that the United States and other governments officially finance and supply weapons to some of these very groups. Though the FSA continues to be sold as “moderate” – it routinely conducts joint operations with Jabhat al-Nusra and other groups. A clear dividing line between “extreme Islamists” and the FSA is a myth sold by the United States and Western governments. …But Abu Majid says local rebels were protecting the women from the regime shelling on an ancient Christian town. Similar propaganda has already begun regarding the ongoing insurgent raids on Saidnaya. In a recent January 24 CNN exclusive report from Saidnaya, the CNN correspondent declared that “Cherubim Monastery is not a civilian target these days” – this because Syrian Army tanks and soldiers are protecting the monastery and the city below. Yet the report also acknowledges that most of the fighters protecting the mountaintop and monastery are simply local Christians who desire to keep the Islamic insurgents from entering. It is unbelievable that a reporter would brazenly declare that a historic Christian monastery that housed elderly monks and was home to summer youth camps is now a legitimate military target for the opposition. The city rings its bells whenever danger is imminent, as was the case when mortar shells hit the Cherubim Monastery and the Convent of Our Lady of Saidnaya during the fourth attack [against the city] on Jan. 19. The city’s citizens are now “wanted” by armed militants. Being from Saidnaya is enough reason to be killed by the militants who have suffered heavy defeats there, the most recent of which was the fourth attack. What’s more, the city’s people are also guilty of being nasara, a derogatory term used by armed groups to refer to Christians. …“You will be next, after Maaloula,” recounts one of the city’s dignitaries. The Al Monitor article also confirms that the orphans at Our Lady of Saidnaya are still in residence as rebel mortar shells continue to rain down. These girls are orphans with nowhere to go, and the convent is their home. The article further confirms that Al-Nusra Front is circulating a video declaring a genocidal war against all Christians. Sadly, major media will on the whole continue to be silent about acts of genocide and religiocide committed by rebels in Syria. Some of the world’s most influential and visible reporters are close enough to events on the ground to know the truth, yet they continue to willfully distort, and commit acts of omission in their reporting. Anne Barnard is perhaps the single most influential reporter when it comes to shaping American and world perceptions of the conflict in Syria. She is the Beirut bureau chief in charge of covering the Middle East for the New York Times. Anyone who knows her work can easily perceive that she consistently and almost exclusively relies on rebel opposition sources in her reporting. Soon the propaganda war began. The FSA posted videos to YouTube claiming that the Assad regime was shelling churches in Maaloula and started promoting them on Twitter using various aliases. This was soon followed by a video in which a wahabi-bearded “liberator” gave a tour of the supposed damage. Their efforts soon met with the desired reward. On September 10, the New York Times ran an article by Anne Barnard giving credibility to such videos and portraying public outcry about Maaloula as potential misperception. Eight days later, Lina Sinjab of the BBC used such materials to portray the whole event as an unfortunate scuffle with few deaths and no particular damage to local churches. The article tweeted by Landis named Barnard as a propagandist attempting to cover up the crimes of the Syrian rebels. Surprisingly, in perhaps a sarcastic or playful acknowledgement of the critique, Anne Barnard “favorited” the article on her Twitter account. This “winking” acknowledgment from Barnard lends credibility to those who say that major media institutions such as the New York Times are willfully distorting the true and full context of the Syria conflict. Saidnaya’s Christians, and all religious and ethnic minorities currently being targeted for genocide by the Syrian rebels need true and accurate reporting of their plight now more than ever. If real and lasting peace, the goal claimed by the Geneva Conference, is ever to be established in Syria, it must begin with a realistic assessment of not just the regime’s crimes and brutalities, but of the unambiguous intention to commit genocide on the part of the rebel opposition. This past Sunday was the Sunday of the New Martyrs and Confessors of Russia, and so the sermon was on the life of St. Peter of Krutitsa: Click here to listen. The folks at Gitmo may want to consider using the second video in an endless loop for enhanced interrogations. Update: It takes all the fun out of something when you have to explain it, but I had a number of people who took the above as if I was trying to make a serious argument. This was intended to be funny, it was based on the old "This is your brain on drugs" public service announcements that began running in 1987. But to the extent that there was a serious aspect of this post, it is this: the good, the beautiful, and the true are connected. The choir in the second video is not a bad choir. It is actually a fairly good choir, doing horrible music. Since Vatican II, the Roman Catholic Church has increasingly been moving in the direction of the ugly and the bad, in direct proportion to the extent that it has moved away from the true. This does not mean that there are not good Catholic choirs, or beautiful Catholic Churches... just as most of what the Roman Catholic Church teaches officially is still true. However, the trajectory in the past 50 years has not been in a good direction. Question: As a former Roman Catholic, in the past I donated funds to have a Mass said for a dead loved one. Is there an Orthodox Christian etiquette to have a Liturgy said for a recently departed friend or candle lit? In the Orthodox Church, we do not have the practice of doing the liturgy for a special intention... in other words, we would not do a special liturgy because someone wanted to have it devoted to prayer for a loved one, either living or dead. The Roman Catholics have such a practice (the Votive Mass), but they also have the practice of having a priest or bishop serve multiple masses in a single day, and serving those masses on the same altar. In the Orthodox Church, a Liturgy is appointed for most days of the year, but a priest can only serve it once, and a liturgy can only be served once on a given alter, and anything to the contrary is strictly forbidden. We do have services that can be requested for specific intentions. For example, you could request your priest to serve a Pannikhida for someone who is departed, or you could request a Moleben (Paraklesis) to pray for some other specific purpose. Within in the context of the Liturgy, there are also ways that you can pray for specific purposes. Of course you can always light a candle in conjunction with any prayer. 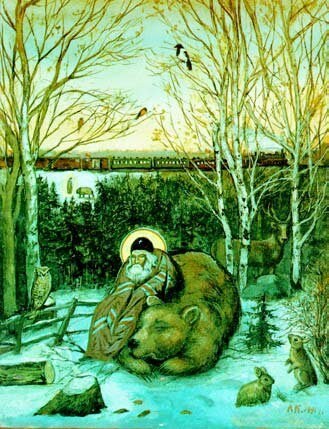 In Russian practice, you can submit a prosphora before the Liturgy, along with a list of people that you wish to be commemorated during the Liturgy. In parishes that do not follow this practice, you could still ask the priest to commemorate specific people when he is serving Proskomedia, and he will take particles out of the loaves used for that service (the Russian practice is the same idea, it simply involves a separate loaf, which is returned to the person that submitted it, minus the particles that the priest removed). You can also ask a parish or a monastery to commemorate either the living or the date on a long term basis (or even perpetually), but one should offer a donation at least sufficient to cover the expense of the prosphoras, and also for the benefit of the parish or monastery, as an offering given to God on behalf of the person or persons you wish prayed for. For example, some people make an annual donation for this purpose, along with a list of the living and the dead they wish prayed for. For more on this, see Holy Bread in the Old and New Testaments and Stump the Priest: Commemorations. Usually, on days other than Sunday, a Litany for the Departed can be done at a Liturgy, and so if your parish does daily Liturgies, or on Soul Saturdays, you could ask the priest to commemorate an Orthodox Christian who has departed. There is also the Litany of Fervent Supplication at each liturgy, in which prayers can be inserted for various purposes, and so for example, you might ask the priest to do a petition for someone who is traveling or who is sick. Of course if you are going to ask a priest to pray for someone, you should be sure to do so yourself. The idea of these practices is that you join your prayers for these people with the rest of the Church, when you submit names to be commemorated at the Proskomedia.